The February 2 launch of a television satellite by Iran has got the juices flowing in “pro-missile defense” quarters in the US. Former professional football player Riki Ellison, who now leads the Missile Defense Advocacy Alliance, used the launch as another opportunity to frighten people into thinking that Iran was now poised to fire one of their non-existent nuclear weapons at the US. Similar dire warnings were sounded from the freshly painted interior of the White House as President Obama’s spokesman Robert Gibbs told the nation: "Efforts to develop missile delivery capability, efforts that continue on an illicit nuclear program, or threats that Iran makes toward Israel, and (Iran's) sponsorship of terror, are of acute concern to this administration." If necessary, Gibbs threatened, the U.S. "will use all elements of our national power" to deal with Iran's nuclear plans. But once you get outside of the borders of the US most experts are not so alarmed about the dangers of Iran’s TV satellite launch. After all, countries all over the world these days are getting into the launch business and putting their own communications satellites into orbit. But when Iran or Venezuela joins the space race, then suddenly it is a big threat to the US because we claim to be the “Masters of Space” and only those we anoint are “allowed” to have access to space. He said they want to put a television satellite into orbit "that could carry their message throughout the Middle East." 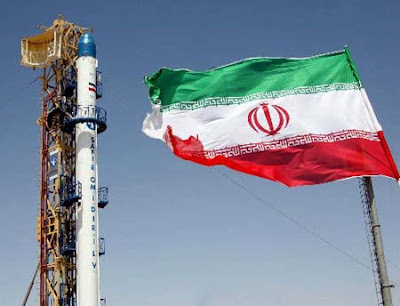 Iran's government spokesman Gholam-Hossein Elham on Thursday reiterated the scientific purpose of launching the country's first domestically made satellite, the official IRNA news agency reported. "The launch of Omid (Hope) satellite into orbit is totally scientific and has nothing to do with military purposes," Elham was quoted as saying, adding that remarks made by “certain countries” are aimed at diverting the discussion. The proponents of “missile defense” in the US are feeling fortunate that Iran has launched the satellite. It will surely help provide some political cover for a program that is now walking the budget tightrope during a severe economic crisis. Sen. Carl Levin (D-MI), who serves as chairman of the Armed Services Committee, recently told reporters that Congress would focus on the existing missile defense program early this year. He notes the program "has problems" and needs to be put up against a more rigorous testing program that deals with real-world scenarios. One of the places where George W. Bush deployed missile defense systems was in Alaska. Reacting to the words of Sen. Levin, newly elected Alaska Senator Mark Begich, a Democrat, told newspapers in his state that any proposed reductions in the program must be accompanied by “military-focused justifications”. He noted many in Congress and the White House are looking to cut spending in some areas to finance an economic recovery plan and called the missile defense system, an “economic powerhouse” in Alaska. “For now, no one in a position to know has shown me that reducing Alaska’s missile defense system makes any sense for our state or nation,” Begich said. It should be noted that Sen. Levin is not opposed to missile defense systems. In fact he, through the last 20 years, has regularly supported the Pentagon’s requests for research and development (R & D) spending during both Republican and Democrat administrations. Levin has just taken the traditional Democratic-party line that deployments should not be rushed and that fully funding R & D and testing should continue. Once a system proves workable, then Levin supports deployment. According to the United Press International, “The final goal is a layered architecture in which ballistic missiles launched against U.S. territory, forces, or allies will face several lines of defense that cumulatively thin out or completely eliminate the threat.